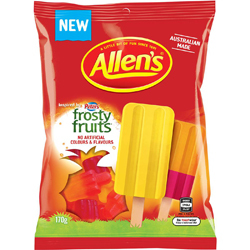 Allens Frosty Fruits is a collection of your favourites. Red, orange and yellow frosty fruits. Inspired by Peters ice cream. Tropical, tasty watermelon & pineapple, tangy orange & pink grapefruit. Glucose Syrup (Wheat or Corn), Cane Sugar, Thickener (Dextrin Roasted Starch, Acid Treated Starch or Starch Acetate) (Wheat), Gelatine, Food Acid (Citric), Flavours, Colours (Carminic Acid, Paprika Oleoresin, Tumeric).